Three decades of rapid industrialization have made China an economic powerhouse and geopolitical force to be reckoned with. It has also polluted and degraded the nation’s air, water and land, compromising future economic growth and development, as well as the health of its human population and ecosystems. Beijing – one of the world’s most heavily polluted areas – has become this generation’s “poster child” for air pollution. A new study published in the Proceedings of the National Academy of Sciences determined that “weather patterns, along with emissions from traffic, industrial plants and aerosol chemical processes combine to produce extremely polluted conditions – forming a thick haze that covers the city for days,” according to a science news report from Futurity.org. China’s urban air pollution problems highlight an increasingly pressing need for the Chinese government to institute regulatory policy mechanisms to limit emissions from stationary and mobile sources. China’s government leaders announced an ambitious anti-pollution plan last fall. Emissions of nitrogen oxides (NOx), sulfur dioxide (SO2) and volatile organic compounds (VOCs) from vehicles and power and industrial plants interact in the atmosphere and trigger a process of “aerosol nucleation” – essentially forming cores around which particulate matter builds up. “We find in our study that the conditions in Beijing are prone to PM formation, because of highly abundant condensable gases,” Renyi Zhang, researcher and distinguished professor of atmospheric sciences at Texas A&M University, was quoted in Futurity.org’s report. The same process, to varying degrees, is taking place in cities across the world. It’s the same one that made Los Angeles the poster child for smog and U.S. air pollution in the ’50s, 60s and 70s, which led to institution of the Clean Air Act in 1963. Air quality in China has been measured at 40-times higher than those deemed acceptable by the U.N. World Health Organization (WHO). Visibility can be less than 50 feet (15 meters), Zhang noted. According to a 2010 Chinese government study, “pollution contributed to 1.2 million premature deaths,” and it’s likely that 500 million Chinese lives have been shortened by a least five years due to air pollution, Texas A&M’s Keith Randall noted in his Futurity.org report. Severe smog tends to occur in the fall, spring and winter months. Summer rains help clean the air by washing out particulate matter, according to the researchers. Beijing isn’t alone among China’s cities. 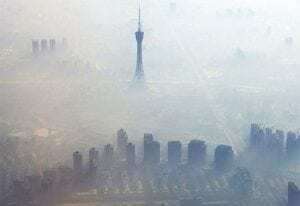 “Beijing’s pollution is similar to other urban cities in China,” Zhang stated. Targeted regulatory controls over NOx, SO2 and VOCs emissions from transportation and regional industry are required in order to reduce air pollution in China, Zhang continued. This is essentially the blueprint of a regulatory regimen that has resulted in significantly improved air quality in the Los Angeles Basin. Those air quality improvements have been hard won and have occurred over some forty years as they were opposed by industry and vested interests. China will need to invest over $800 billion to clean up air pollution, a spokesman for the Beijing Municipal Bureau of Environmental Protection stated in September 2013 upon the release of the capital city’s anti-pollution plan. Toxic smog reached record levels in the winter of 2012, engulfing the city in a thick haze for weeks. “Improving air quality in that country will likely have profound consequences on China or even the world economy,” the researchers state. The study was made possible by a collaborative research program between Texas A&M, the National Natural Science Foundation of China and the Robert A. Welch Foundation supported by China’s Ministry of Science and Technology.